If you’re thinking “I’ve never seen KastKing in Bass Pro before”, you’d be exactly right. KastKing exclusively sells their products on their own website or other online channels. KastKing creates reliable and strong fishing gear and is able to keep their prices below competitors because they don’t pay shelving costs, not because they’re any less quality. All that said, we’re a fishing tackle website based on products we’ve actually been able to test. We had to put it through a few real life scenarios before we were convinced. But first, let’s start with the basic specifications. The Kodiak 3000 is 100% aluminum alloy spinning reel with a new drag system that provides up to 39.5lbs of stopping power. The 10+1 shielded steel ball bearings matched with carbon fiber drag makes the entire reel ultra smooth and it is perfect for saltwater fishing due to the sealed rotor and spool design. Now, if you’re just learning about reels, we’ll give you a quick comparison about what this actually means. We sorted through Bass Pro’s saltwater spinning reels to find these specs at this price … and we couldn’t. The closest we found was an $80 reel with a 5.2:1 gear ratio but only brings 13lb drag to the party. That’s an enormous 26.5lb difference! Literally triple the drag power! Tell us that doesn’t matter when your personal best redfish swims away after he spools your line because your drag couldn’t slow him down. The first thing you’ll notice when you pick up the Kodiak is the handle and thumb grip are incredible. There’s a slight contour for your thumb to rest, and little details like that always add up for us. 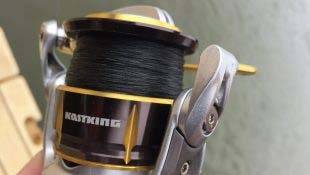 The bail opens and closes smoothly while the spool sends out your line effortlessly during a cast. The fiber drag feature also makes for a smooth and steady pull to slow down your fish. The 39.5lb drag is no joke, either. When it’s wound to about 80%, we couldn’t pull out the braid even after wrapping it around our hands a few times. That said, you need to be careful setting the drag too high. Setting the drag to 1/4 or 1/3 of your line’s breaking strength will get the job done. If you put strong enough line on the Kodiak and pair it with a stout rod, we have no problem saying you could turn a 30lb – 40lb redfish on one of their signature drag-screaming runs. 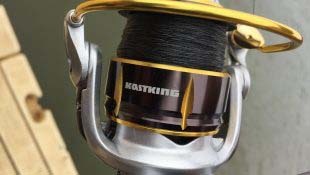 Speaking of redfish and saltwater fishing, KastKing designed this aluminum spool to keep salt and sand out. It’s saltwater fishing approved and ready to get splashed in your kayak. (You should still always spray down your equipment with fresh water after a saltwater fishing trip.) It’s also a reel we wouldn’t worry about when fishing in the rain. Reeling in the Kodiak didn’t seem like the fastest task, but we almost didn’t notice. The 5.2:1 ratio is definitely average, but the retrieve is smooth and free of vibration or bumps. That way you can feel everything your bait touches, or more specifically a bite from a fish. 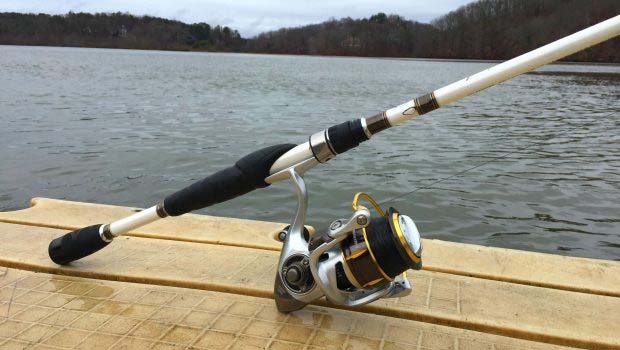 Drag Stopping Power – 39.5lbs is incredible for this reel size. 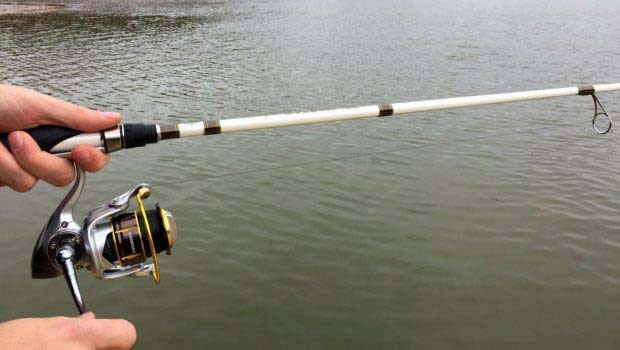 With a sturdy rod and strong line, you could realistically put up a fight with most fish in the ocean. No, not Jaws, but we bet you could tire out a big jack, mackerel, or striper no problem. Travel Case – It comes with a neoprene travel case. No more scratches coming from road trips. Price – $85 is a great deal for the power this reel will bring to your arsenal. Only available online – As a company that exclusively reviews products we’ve been able to test, we understand any hesitation. 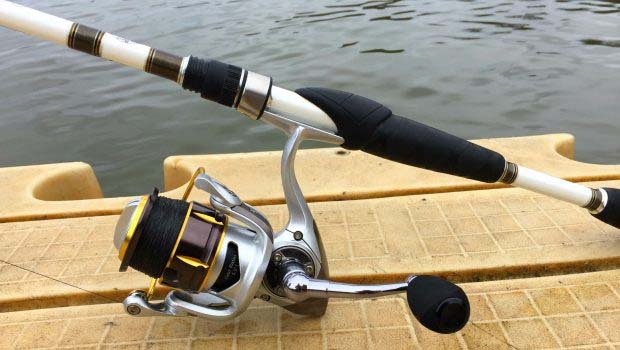 If you HAVE to try a reel before you buy it, this may be a hard purchase for you. Gear Ratio – 5.2:1 – If you want to spend more money you can find a better gear ratio. 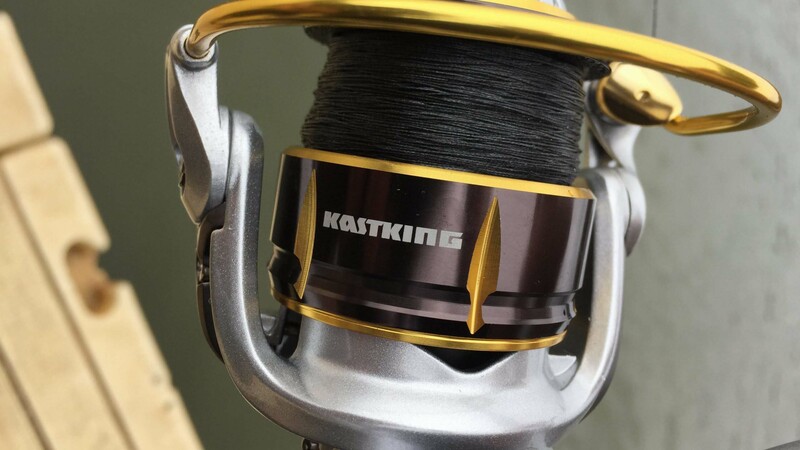 The KastKing Kodiak 3000 lives above its own price range, but it doesn’t really compete with reels like the Shimano Stradic 3000 ($200) because of its gear ratio. 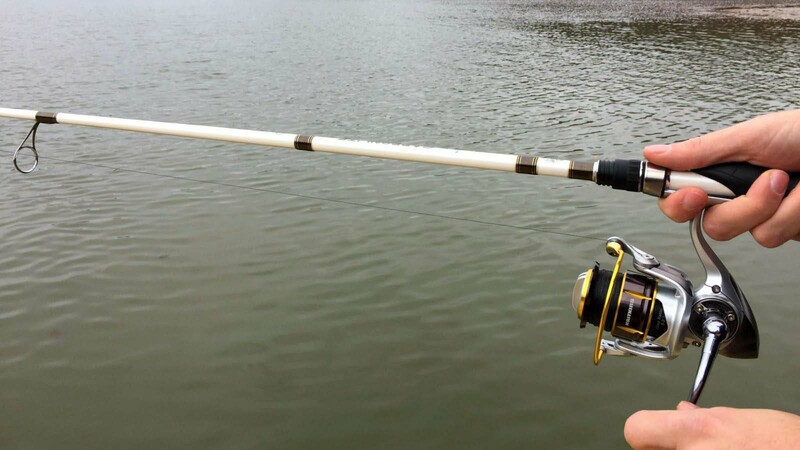 That said, we have no problem using the Kodiak as your everyday fishing reel that will bring in fish worth taking pictures of. It’s built to last and you could be fishing with this reel for many years to come if you take care of it.